Sravani, the sacred thread changing ceremony, and Raksha Bandhan are celebrated on the full moon day of the month of Shravan (June-July) and are often regarded as two names for the same festival. This is not strictly true because Sravani is a specifically Brahmin festival referred to in the sacred Sanskrit texts as Rishi Tarpan or Upa Karma. It is a very ancient Vedic festival and even today is regarded as important in Bengal, Orissa, southern India, Gujarat and some other states. The more popular of the two festivals, however, is Raksha Bandhan. We do not have any reliable evidence on when, why or where Raksha Bandhan came into vogue. There is, however, a well-known tale in the Puranas about a fierce battle that raged between the gods and demons. From news received from the battlefield it appeared that the demons were getting the upper hand and would gain victory. Indra, the supreme deity, summoned his teacher Vrihaspati to his court for advice. Indra's wife Indrani was also present. Before the teacher could speak, Indrani rose and said, "I know how to assure the victory of the gods. I give you my word that we will win." The next day was the full moon night of the month of Shravan. Indrani had a charm prepared as prescribed by the sacred texts and tied it on the wrist of her husband. And no sooner did Indra appear on the battlefield with the charm onhis hand than the demons scattered and fled. The demons bit the dust and the gods were victorious. It would appear that the Raksha Bandhan of today is derived from this belief. It is held that if a chord made according to the prescriptions of the holy texts is tied round the wrist of a person on the full moon day of Shravan it will ensure him good health, success and happiness for the year that follows. Whatever be the origin of Raksha Bandhan, today it has come to be a kind of sisters' day, symbolising the love that binds them to their brothers.No matter where a brother may be, be he across the seven seas, on this day he must wear the coloured chord round his wrist. You can realise the sanctity of this custom from the fact that, even if a girl who is a total stranger ties this chord on the wrist of a young man, from then on the two regard each other as brother and sister and consider themselves closer than other blood relations. Many days before the festival, stalls are set up at different places, packed with colourful and glittering masses of Raksha Bandhan wristlets. In some smaller towns, whole rows of bazaars sell nothing but these rakhis of all shapes and huesred, yellow, pink, green, blue, trimmed with silver and gold thread. At these stalls one can see throngs of women of all ages, ranging from tiny tots to middle-aged matrons, who come for their rakhi shopping dressed in their best fineries, as colourful as the rakhis they buy. Rakhi prices vary from five paise for a coloured string to a gaudy silver-and-gold laced affair worth five rupees. At the same time, sweetmeat vendors do a roaring trade. They put out all their delicacies on displayladdoos, jalebis, barfi, balushahi, imarti, gulab jamuns, rasgullas and cham-chamthe more you gaze at them, the more yourmouth will water. You forget all the doctor's warnings that eating sweets is bad for the teeth and digestion; these sweets are a must for Raksha Bandhan. When the great day dawns (the full moon night of July-August), the girls' excitement has to be seen to be believed. On other days they may sleep late but on Raksha Bandhan they are up before dawn. After a quick bath, they get into their best clothes. By then their brothers are also bathed and dressed. Then the girls take the rakhi still attached to its strip of cardboard and put it on top of a thali full of sweets. Covering her head with her dupatta, the sister seats herself in front of her brother, daubs his forehead with vermillion, saffron and rice powder, takes the colourful rakhi and ties it to his wrist. She will then take a piece of some sweetmeat and playfully stuff it in her brother's mouth. He, in his turn, as a mark of his affection, places some money on the thaliit may be anything upward of a rupee. Till the girls have tied the chord on their brothers' wrists neither will break their fast. 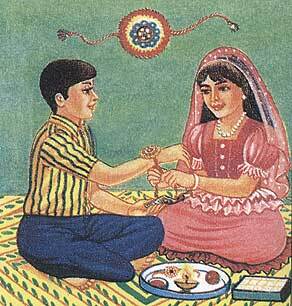 All that day, till the evening, the brother will keep the rakhi on his wrist. It is also customary to fry poories and cook vermicelli pudding on this occasion. When a girl ties a rakhi on her brother's wrist, she makes fervent wishes for his prosperity, happiness and success in all he undertakes. In return, he renews his pledge to guard her honour and self-respect with the last drop of his blood. On Raksha Bandhan day, Brahmins and priests also tie rakhis round the wrists of their patrons and in return receive offerings from them. In some parts of the country, it is customary to draw figures on house walls and worship them with offerings of vermillion or kheer. The imprints of palms are also put on either side of the entrance and rakhis are stuck on them. In India the same festival is celebrated in slightly differentforms in different areas. This is also true of Raksha Bandhan which is known by a variety of namesRakhi, Rakhri, Saluno. Although at Raksha Bandhan there is no display of fireworks, no beating of drums, or decorating of homes with coloured lights, this festival has an importance of its own. The gift of money that brothers give when their sisters tie the rakhi on their wrist may appear trivial at first sight but it means more to the girls than all the wealth of the world. There are many instances in our history when the real worth of these seemingly worthless pieces of string was demonstrated in the field of battle. The most famous of these incidents is the tale of Maharani Karmvati (or Karunavati). It is said that once Governor Bahadur Shah besieged her kingdom. 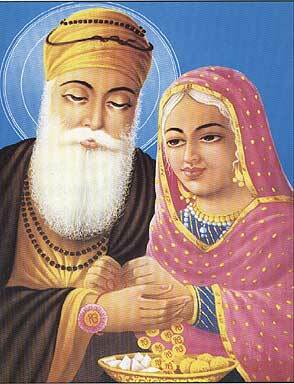 When Karmvati saw the countless horde led by Bahadur Shah, she lost heart. Then suddenly she thought of Emperor Humayun. She sent him a rakhi. Normally Emperor Humayun would not have gone to the aid of a Hindu Maharani fighting Bahadur Shah. But so strong was the tradition of rakhi that Emperor Humayun immediately proceeded to Mewar. By the time he got there, however, the Maharani had immolated herself on a funeral pyre. The Emperor was grief-stricken. But he pursued Bahadur Shah, caught up with him, and routed his army. In the annals of the Mughals, there are many instances of Mughal emperors accepting rakhi bands from Hindu women and pledging to respect their honour. The history of Rajasthan is replete with examples of sacrifices of life made by men to protect the honour of women who had tied rakhis on their wrists. During the freedom movement, many women tied rakhis on men's wrists and made them pledge their lives to the struggle for India's liberation. It was probably for this reason that the great leader of Bengal, Surendranath Banerjee, tried to elevate Raksha Bandhan to the status of a national festival.Women who have no brothers, or men who have no sisters deserve our sympathy. If God were to ask them for a wish, without doubt, instead of asking for good luck or prosperity, a woman would ask for a brother and a man for a sister.